There is much to say about this type. Its origins are a mixture of references to Old Testament events, to symbolic references to Mary found in the Akathist hymn and canon, and a good portion of it comes simply from apocryphal writings such as the Book of Enoch and the Book of Jubilees, particularly those portions relating to the angels surrounding the central figure of Mary holding the child Christ (Christ Emmanuel). The Russian type, which began to spread in the late 16th century, is quite different than the standard Greek type, which depicts Mary in the Burning Bush of the Book of Exodus. It is a detailed icon, and rather intimidating for the beginning student because of its unusual iconography and often detailed and unfamiliar inscriptions. Nonetheless, it is a visually attractive type, being in the “mandala” form that the psychoanalyst Carl Jung considered a symbol of wholeness. In discussing the iconography of this type, one should keep in mind that there are variations from example to example, both in the figures included and in the inscriptions, though they are usually variations on the same basic concepts. Different painters might arrange figures differently and vary the inscriptions according to the models available to them and according to their own understanding. And painters sometimes did not understand their models well, or made mistakes. The particular icon I will use as the primary example of the type is very well painted, and pleasing both in its figures and in its calligraphy. Other examples will vary somewhat, but if you understand this example, you should be able to see the essence of the type through such variations. 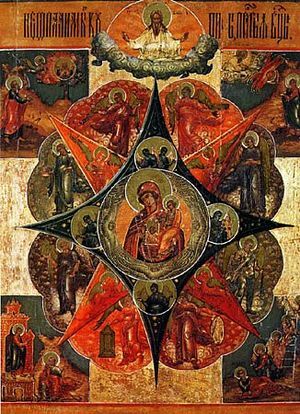 As you see, the icon consists of an image of Mary and the Christ Child (Christ Immanuel) set in a bright circle in the center of a blue and red eight-pointed slava (“glory”) symbolizing not only the Eighth Day of Creation (the “Day of Eternity”) but also the Godhood in its two manifestations of light and dark, that which is revealed and that which is a mystery (the “Divine Dark”). If you have mystical tendencies, you might like to view the light and red part as the cataphatic approach to spirituality through words and descriptions and concepts, and the dark blue part as the apophatic approach through negation, through getting rid of words and descriptions and concepts. Or you could just forget all of that and see it as a pretty red and a pretty blue, as did most Russian iconographers. Mary is surrounded by angels, both in the blue quadrangle and in the outer “petals” that form an elongated simple rose-like form. In the four corners, like the metal corners on an old bound book, are Old Testament scenes considered prefigurations of Mary. So now we know the title. It is the “Unburnt Thornbush” image of Mary. She is holding Christ Immanuel, the child Jesus, as indicated by the IC XC Iesous Khristos abbreviation above his head. He holds a rolled scroll in his left hand and blesses with his right. “Forasmuch as you saw that the stone was cut out of the mountain without hands, and that it broke in pieces the iron, the brass, the clay, the silver and the gold.” This signifies the virgin birth of Jesus from Mary, supposedly born without the participation of a human male. On Mary’s left shoulder is another crowned image, but in red; this is Jesus as “Sophia, Wisdom of God.” In that form he is shown as an angel with a red face. I should add that some people identify this figure rather loosely as Christ as Tsar Slavui, “King of Glory,” but in this example Sophia better fits the iconography. Under Mary’s right hand is a ladder. This is one of her symbols. In the Akathist hymn are the words “Rejoice, Heavenly Ladder by which God descended.” So Mary symbolically is the “ladder” that gave birth to the heavenly Christ, his means of coming from heaven to earth. That was not too difficult, was it? Well, as the saying goes, “You ain’t seen nothin’ yet.” It is time to look at the figures in the outer points of the eight-pointed slava. This figure, in the form of an angel with a book, is Еуаггелистъ Матфей — Euangelist Matfei — the Evangelist Matthew, holding his gospel. This figure is Еуаггелистъ Марко, Euangelist Marko, the Evangelist Mark. He is depicted as an eagle holding his gospel. This is Еуаггелистъ Лука — Euangelist Luka — the Evangelist Luke. He is depicted as an ox, and holds his gospel. This figure is Еуаггелистъ Иоаннъ — Euangelist Ioann — the Evangelist John. First, there is this multi-winged angel. Traditionally a seraph is painted red and a cherubim (Russians always use the plural for the singular in this case) blue, but some painters do not follow this strictly, and this figure has no inscription. But we will assume a seraph is intended, due to the fiery nature of this icon. The inscription reads: Творяи Агглы своя служение снегу и инею — Tvoryai Angli svoya sluzhenie snegu i ineiu — “He makes his angels serving snow and hoar frost.” You will notice another inscription in red just above the “green” angel’s head, but we will deal with that later. The inscription is: Духъ благочестия Аггела мести нанасупостаты подая чашу горести — Dukh blagochestiya Angel mesti na supostatui podaya chashu goresti — “The Spirt of Piety, the Angel of vengeance on enemies, presenting the Cup of Woe. The inscription is: Аггелъ паления сиреч хотящаго быти от праведнаго суди и поделомъ — Angel paleniya sirech khotyashchago buiti ot pravednago sudi i podelom — The Angel of Burning, who will be sent forth by the Righteous Judge and according to [their] works. “And the angel of the presence spake to Moses according to the word of the Lord, saying: Write the complete history of the creation, how in six days the Lord God finished all His works and all that He created, and kept Sabbath on the seventh day and hallowed it for all ages, and appointed it as a sign for all His works. For on the first day He created the heavens which are above and the earth and the waters and all the spirits which serve before him -the angels of the presence, and the angels of sanctification, and the angels [of the spirit of fire and the angels] of the spirit of the winds, and the angels of the spirit of the clouds, and of darkness, and of snow and of hail and of hoar frost, and the angels of the voices and of the thunder and of the lightning, and the angels of the spirits of cold and of heat, and of winter and of spring and of autumn and of summer and of all the spirits of his creatures which are in the heavens and on the earth; (He created) the abysses and the darkness, eventide (and night), and the light, dawn and day, which He hath prepared in the knowledge of his heart. We see Моисей — Moses — kneeling to take of his shoes as he looks toward the Burning Bush in which Mary is seen in the Znamenie — “Sign” form with the child Jesus. An angel is at left of the bush. This image signifies that the Burning Bush of Moses was a prefiguration of Mary, who in her pregnancy with Jesus was filled with the fire of divinity, yet was not consumed. 5 And he said, Draw not nigh hither: put off thy shoes from off thy feet, for the place whereon you stand is holy ground. 1 Then he brought me back the way of the gate of the outward sanctuary which looks toward the east; and it was shut. This closed door too is a prefiguration of Mary, the “Door of Solemn Mystery” in the Akathist hymn. It symbolizes the perpetual virginity of Mary in giving birth to Jesus. Of course these prefigurations are just the result of theologians reading Mary back into the Old Testament. Now that I have discussed this interesting and detailed type of the Unburnt Thornbush, there are, as mentioned earlier, variations on this type. Some examples show only the central figure of Mary and Child on the slava with the symbols of the Four Evangelists around them. A later, commonly State Church type shows the Archangels instead of the angels of weather and apocalypse. In the latter case, the Archangel Michael holds a rod, Raphael holds an alabastron (alabaster vessel), Uriel holds a flaming sword, Selaphiel holds a censer, Barakhiel holds Grapes, and Gabriel holds a branch from Paradise. Not surprisingly, this Greek type is traditionally associated with the Monastery of St. Catherine at Mount Sinai, where the monks will still point out a tangled mass of shrubbery atop a wall, and tell you it is the same Burning Bush that Moses saw, though others may say it is taken from a stock of that bush. In any case, the shrub is a kind of bramble, Rubus ulmifolius, subspecies sanctus — the “Holy Bramble.” The age of fable is not dead. This is the “Fiery-faced” icon of Mary, also known as “Fiery Visage” and “Seen in Fire.” Its Russian title is Ognevidnaya — ОГНЕВИДНАЯ. Historically, there is little that can be said about this icon, because its origin and the date of its “appearance” are unknown. It depicts Mary without the Christ Child, seen shoulder length to half-length. It is found in Russian iconography of the 18th-early 20th century, frequently on multiple icons of Mary, that is, icons that depict more than one “wonder-working” icon of Mary on the same painted panel. The icon is likely based upon the symbology that equates Mary with the Burning Bush seen by Moses in the Old Testament — the bush that burned with fire but was not consumed. Thou have preserved the bush unharmed, O Master, though it was united with fire, and you have shown to Moses your flesh shining with divine brightness, while he sang: Glory to Thy power, O Lord…You were revealed as an immaterial fire that does not burn the material substance of the body, when you have appeared to Moses and the apostles and Elijah, O Master Who art one in two natures and both of them perfect. So, Mary was filled with the fire of divinity (thus her fiery red face in this type) but was not harmed by having Jesus within her — the bush that burned but was not consumed. Here is a typical example of a multiple icon from the 19th century. This example is a four-part icon, which was particularly common, but sometimes even more icon types were included on a single panel. 2. Огневидная — Ognevidnaya (Ognevidnuiya) — “Fiery Visage” Mother of God, discussed above. 4. Утоли Моя Печали — Utoli Moya Pechali — “Soothe My Sorrows” Mother of God. It is said that this icon was brought from Belarus to Moscow by Cossacks in 1640, and was placed in the Church of St. Nicholas in Pupuishev. A commemoration of the icon was established after a noblewoman was said to have been healed of paralysis of the legs by the icon. According to the origin story, Mary appeared to her and told her to pray before the icon Utoli Moya Pechali” — “Soothe My Sorrows” — which was to be found in the St. Nicholas Church in Moscow. The woman journeyed to Moscow and asked for the icon, but it was not discovered until the priest brought some neglected old icons down out of the bell tower, one of which was the “Soothe My Sorrows” image. This motif of Mary appearing in a dream and revealing a miracle-working icon, often one that has been forgotten or neglected, is common in the hagiography of Marian icons. A prayer service (moleben) was held before the image, and supposedly the woman was able to walk out of the church healed. This was on January 24, 1760. A number of other supposed miracles are also attributed to this icon. Incidentally, the four small border images depict at left the Guardian Angel and St. Peter, at right Venerable Vasiliy (Basil) Pariyskiy (Василий Парийский) and St. Paul.